What is not up for debate is that trees are good for protecting local waterways. “Polluted stormwater runoff is the number one threat to the Huron’s health. Trees soak up stormwater with their roots and intercept rainwater in their canopies. They filter pollution such as pesticides, fertilizers, and animal wastes out of runoff; and they shade the river and its streams, keeping them cool. 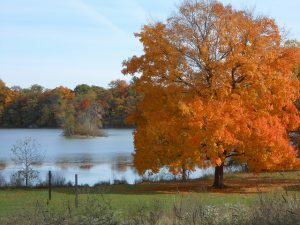 One tree can intercept 1,763 gallons of runoff water each year.” Huron River Report, Fall 2014, Hardworking Trees, Low-cost watershed workers. Need more proof? Check out Trees Tame Stormwater, an interactive poster from the Arbor Day Foundation. Drag the slider from few trees to abundant trees. Notice how clean and sparkly the urban river becomes — no doubt due to less polluted stormwater coming through that stormdrain (middle right). Want to dig deeper? Take a look at a Review of climate impacts to tree species of the Huron River watershed, from HRWC’s Climate Resilient Communities project. As climate zones shift across the Great Lakes region, some populations of native tree species will be stressed, and habitats may become more suitable for species from outside the region. Geared toward natural resource managers in the region, the guide includes tree species change summaries. You can see general trend predictions for trees like Red Maple and White Pine. For more how-to info see Home Trees & Shrubs from Michigan State University Extension.